Today, we’re excited to announce that we have partnered with the City of Indianapolis. This partnership, led by Mayor Ballard, will enable the Mayor’s Office of Neighborhood Services to use Nextdoor as a city-wide communications tool. We are very excited to officially welcome the City of Tulsa onto Nextdoor! Today, I went home to Tulsa, OK to join Mayor Bartlett to announce a partnership between Nextdoor and the City of Tulsa. Initially, this partnership will enable the Working in Neighborhoods Department to send targeted information to Tulsa residents on Nextdoor. 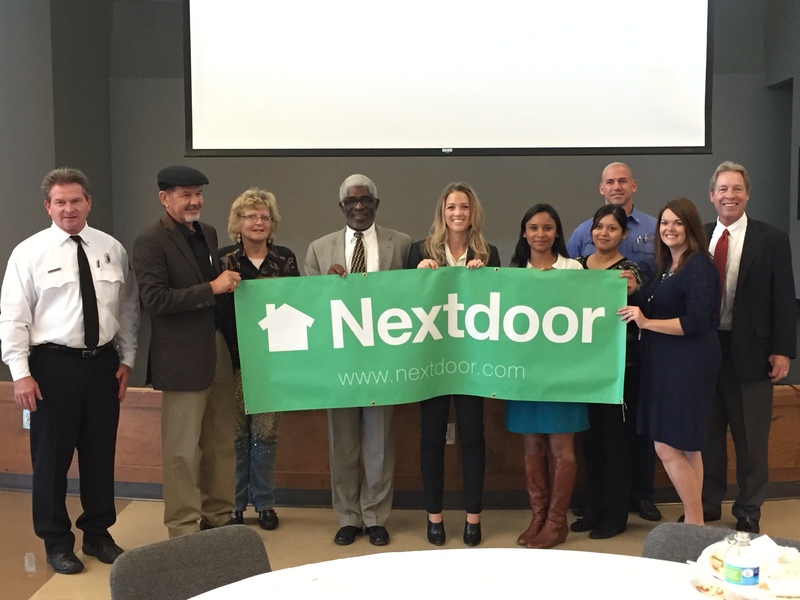 More than 125 neighborhood leaders and representatives from the Tulsa Police Department, Fire Department and Crime Prevention Network were in attendance to learn more about how their residents and agencies could benefit from Nextdoor. Today, nearly 100 Tulsa neighborhoods already use Nextdoor to connect with each other about the things that matter most in their communities. It is very exciting to see my hometown of Tulsa share in Nextdoor’s mission of bringing back a sense of community to the neighborhood and working to build stronger and safer places to call home. We look forward to welcoming many more residents and agencies across Green Country onto Nextdoor! With the help of Nextdoor, 250 neighbors in the Rolling Green neighborhood of Rockford, IL are connecting like never before. From little things like providing a ride or making a meal for a sick neighbor, Rolling Green neighbors are looking out for one another. They have even developed their very own neighborhood safety initiative called “Take 5,” which calls for residents to survey their front and back yards twice a day to make sure nothing suspicious is happening. “If we see a suspicious vehicle drive around the neighborhood, we can put all the info on Nextdoor in the crime and safety section and send that out in an Urgent Alert to all the neighbors,” says Nextdoor Rolling Green member Heather V.
Along with this greater sense of safety, has come an even greater sense of community. “We’re trying to get that whole togetherness back that the neighborhood once had, and Nextdoor helps us do that,” continued Heather. As reported by NBC Rockford. Today, we’re excited to announce that we have partnered with the City of Pittsburgh. This partnership, led by Mayor Peduto, will enable to Mayor’s Office, the Department of Public Safety, and the Department of Public Works to use Nextdoor to build stronger, safer communities with the help of Pittsburgh residents. Nextdoor has already proven to be an essential and well-adopted tool for Pittsburgh residents. 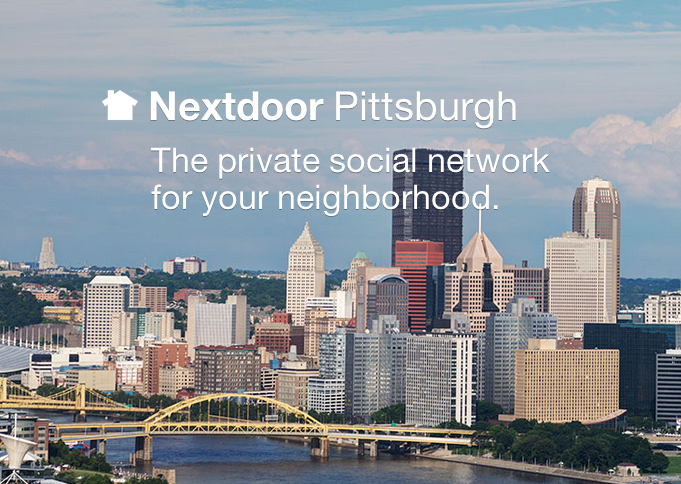 More than 67 neighborhoods, representing 80% of the City of Pittsburgh, have started Nextdoor websites. We are always looking for new ways to bring the power of Nextdoor to new neighborhoods across the country. Not surprisingly, neighbors, cities, nonprofits, and media organizations want to do the same. One in particular, Cleveland’s NewsChannel 5, just kicked off the Building Better Neighborhoods (BBN) initiative across Cleveland. NewsChannel 5 shares our mission of helping to build stronger, safer communities. The Building Better Neighborhoods initiative empowers Cleveland-area neighbors to get more involved in their communities by getting to know each other, their elected officials, and their police officers. We are excited to be the official app chosen by NewsChannel 5 to help the BBN initiative strengthen communities across Cleveland. Over the next few months, NewsChannel 5 will feature the 25 Cleveland-area communities that have committed to building better places to live, one street or neighborhood at a time, by highlighting the characteristics and neighbors that make each community unique. More than 300 Cleveland-area neighborhoods already use Nextdoor. Our hope is that more Cleveland residents will learn about how they can use Nextdoor to strengthen their neighborhoods. Whether that is simply joining to get to know new neighbors, rallying together to make the best of the winter weather, or coordinating a neighborhood park clean-up, we want neighbors to use Nextdoor to connect with each other and help bring back a sense of community to their neighborhoods. One of our die-hard local Cleveland representatives, Jeremy Taylor, will be working closely with NewsChannel 5 and the BBN communities to use Nextdoor to better connect with each other like so many neighborhoods in the area have done already. The BBN initiative will kick off with a special segment airing this Friday, March 21 at 8:30 p.m. ET on NewsChannel 5. We are excited and humbled by this opportunity to work with NewsChannel 5 and help these neighborhoods stay connected during the BBN initiative and for many years to come. Everyone has their own unique way of sharing their holiday spirit with their neighbors. While 86% of Americans decorate for the holidays, more than half choose to show their seasonal cheer by decorating with lights. Some go over the top and adorn every window and walkway, while others choose a simply stated holiday wreath to mark the season. 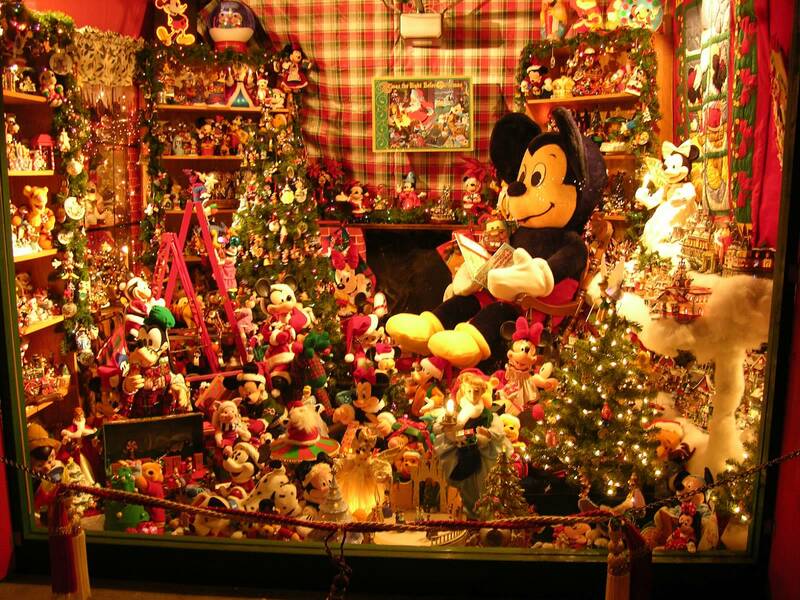 Les Mize of Nextdoor Lucas Valley/Marinwood shares his holiday spirit by decorating his home with a Disney theme that includes hundreds of Disney figurines among his holiday lights in his garage. Whatever you do this time of year to show your spirit, we hope you’ll share the season with your neighbors by coming together for festive events, enjoying each others decorations, and honoring old neighborhood traditions or even making new ones. In honor of this holiday season and all of the wonderful ways neighbors choose to celebrate, we created the Nextdoor Holiday Lights Map to help bring neighbors together. Using the Holiday Lights Map, neighbors share their holiday cheer with each other by marking their home on the neighborhood map with a holiday light icon, festive photo, and message. Share. 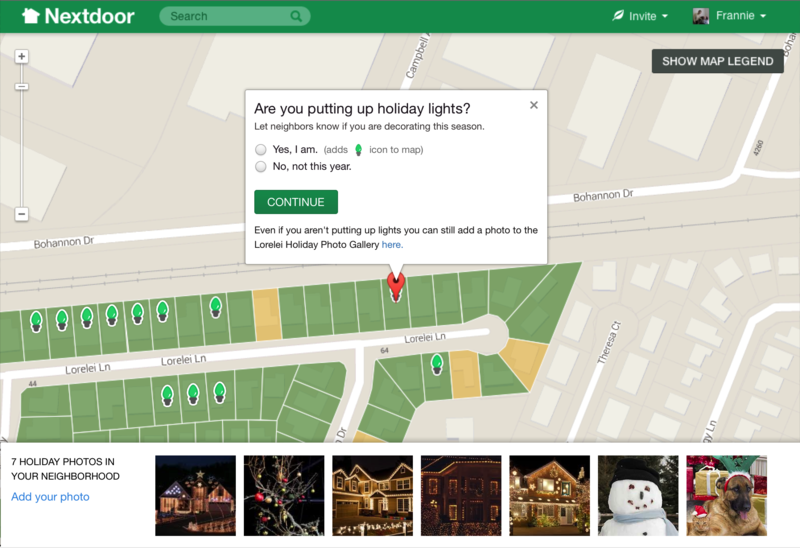 Members can add themselves to the map and even post a photo showing how they celebrate the season with their neighbors, including family photos. Come together. Plan walks through the neighborhood to see each other’s light displays and visit with one another. Build new traditions. As the neighborhood map lights up, neighbors may decide to start new holiday traditions like a decorating contest, caroling, or a holiday home tour. You can start spreading the cheer on your Holiday Map on the website or from your mobile device. If you would like a step-by-step guide on how to light up your Nextdoor Neighborhood Map, you can find one here. Wishing you and all of your neighbors the happiest of holidays from Nextdoor!